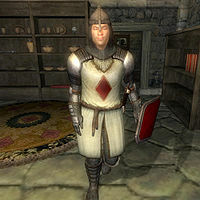 Gukimir is a Nord knight added by the Knights of the Nine official plug-in. He will appear at the Priory of the Nine with his brother, Geimund, after the first Knight of the Nine has joined the Priory. He requests to become a Knight of the Nine. Once he is a knight his name becomes Sir Gukimir. He then joins the Knights of the Nine faction. He claims to have come from Skyrim. Before he arrives at the priory he is equipped with legion greaves and iron armor: a cuirass, gauntlets and iron boots. He is armed with an iron battle axe and carries a set of lower class clothing: a collared shirt, sack cloth pants and a pair of rough leather shoes. After he joins the Knights of the Nine his armor is replaced by the standard Knights of the Nine outfit: a Knights of the Nine cuirass and shield, chainmail greaves, gauntlets, helmet and boots. He is then armed with a leveled longsword and bow with silver arrows. When you first speak to Gukimir he will greet you by asking if he and his brother could join your order; "Hail, Sir Knight! My brother and I have heard that you are founding a holy order of knights, and we would like to offer you our swords. We've come all the way from Skyrim to join up. We can't claim any experience as knights, but we learned soldiering from our years in the Legion. Will you have us?" If you agree that they are worthy to become members of your order he will thank you for accepting him, and inform you that he will change into proper attire for a knight: "You won't regret it, sir. You'll find us true-hearted and brave. I'll be back as soon as I've outfitted myself." If you deny his request to join your order he will humbly accept your decision, and will also claim that you will eventually change your mind about them: "You're the commander. We know how to take orders. But I know that one day we'll earn your trust." Speaking to him again after you reject him will lead to him asking if you had changed your mind: "My brother and I still hope to serve the gods as Knights of the Nine. Have you changed your mind? Will you induct us into the Order?" offering you the same choices as the last time you spoke. Umaril the Unfeathered: Defeat Umaril and kill him for good, in both the physical and spiritual planes. It is possible for Gukimir to be stuck permanently following you if you trigger the KotN follower bug; see bugs for details. Gukimir rides a Chestnut Horse that can be found in the Priory's stables after the brothers have arrived. You are free to use this horse, since the horse is not labeled as being owned by Gukimir. This page was last modified on 17 October 2018, at 20:08.